Is Ingrown Toenail Treatment Painful? Ingrown toenail treatment carried out by a podiatrist does not cause pain. It is done by using a very, very fine chisel less than 1mm thick originally designed for neurosurgery, to trim off the bad part of the nail. In this case, only the nail and not the skin is cut. Where that is not possible, all of our podiatrists are licensed to use injectable local anaesthesia. This ensures that all procedures can be carried out in comfort. 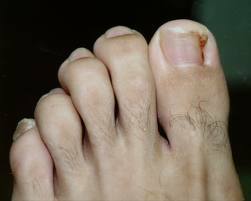 Stronger types of anaesthetic injections are also available for toenail surgery. For more information, please browse to our printable Ingrown Toenail Info Sheet. Alternatively, use this link to return to the Podiatry FAQs Blog.